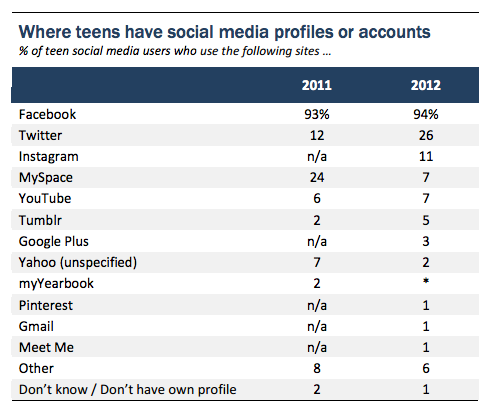 Kids are ditching Facebook. No one uses Facebook anymore! I’m really going to quit Facebook. Any day now, I swear. It’s full of ads and it’s spammy. Only old people are on Facebook. Literally everyone has switched to Snapchat. We have heard these refrains a million times. Every time I talk to a VC or a developer or a teenager or my middle-school cousins, they all tell me the same thing: No one is using Facebook anymore, and particularly not teenagers, who are leaving in droves for Tumblr and Snapchat. Facebook CEO Mark Zuckerberg has been challenging the claim about teen flight since the company went public — not surprisingly, since we all know kids are the future, and it’s not a great sign if they’re leaving you. But on Wednesday, he spoke more strongly about it than on any previous call. And for once, his entire defense didn’t rest on the crutch of Instagram. He said Facebook itself continues to be popular with teens. Zuckerberg didn’t offer much substantial data to prove that teens aren’t leaving, but even if you take his statements with a grain of salt, it’s hard to ignore the company’s massive growth in users and its gains on mobile — a platform that teens love. A billion users isn’t something to scoff at, or something that’s going away any time soon. Personally, I’ve changed how I use Facebook a lot over the past few years. I joined when they opened the site up for non-college students in 2005. I was a sophomore in high school, and it was absolutely *the coolest* thing to be on Facebook. In fact, you could open conversations with people by asking if they were on Facebook, because it was sure to prompt a discussion. I don’t feel that excitement or cliched “delight” that people talk about on Facebook anymore, and I don’t post personal updates there or check my recently-tagged photos anymore. But simply by joining the site at age 15 and amassing virtual friends on the platform over the past eight years, I have hit the point where Facebook is my de facto directory of contacts, and it’s hard to imagine giving that up — as frustrated as I might be with the ads or excessive noise. Through Facebook, I can get in touch with anyone I want from high school or college, with the exception of just one or two people who are my Not-On-Facebook friends (and I remember exactly who they are). It is the first place I go to look people up, the way to message someone whose number you don’t have, and as I wrote last week, still the first place my friends and I go to stalk potential dates, even if Instagram and Twitter are just as useful stalker tools. Facebook might not be exciting anymore, but it’s huge, and we’re still using it — an idea that Pew backed up with its most recent study of teen social-media use. The report found that Twitter use was skyrocketing, and it cited teenagers who said there was just too much drama on Facebook. And maybe if you’re 18, there is a lot of drama on social media. But the numbers? They still speak for themselves when it comes to quitting. This isn’t to say that Facebook can rest easy — a massive user base of people who are vaguely unhappy with you is not a great position to be in. Growth at companies like Snapchat and Tumblr should concern Zuckerberg — and it would seem that it does, if he’s opening earnings calls trying to cast doubt on their threat to his company. At this point, my relationship with Facebook is kind of like my relationship with a cable company or an airline: It’s not a pleasant experience by any means, but if there aren’t any true substitutes for what they offer, I’ll deal with the pain and keep coming back. Social platforms ARE the new cable companies. The pipe is the relationship between people and objects. The dumb pipe is open graph distribution it offers to other apps. Smart pipe is the content being shared, engagement on that content, etc. Premium content still yet to be rolled out but it’s not hard to imagine Facebook being the primary distributor of movies and music in pre-release windows where fans pay $$ for early access.